A punishing weather pattern has heaped heavy rainfall on Northern Sri Lanka, causing widespread flooding and disrupting life for thousands of children and their families. The Mullaithivu district situated in the Northern Province of Sri Lanka has been experiencing a weather pattern of heavy showers over the last few weeks due to the beginning of the seasonal monsoon. Heavy rainfall, thunderstorms and high winds have been reported. The area is currently affected by floods and strong winds causing damage to the community. Heavy rains and high winds are still continuing in the area and the situation is expected to get worse in the coming weeks. 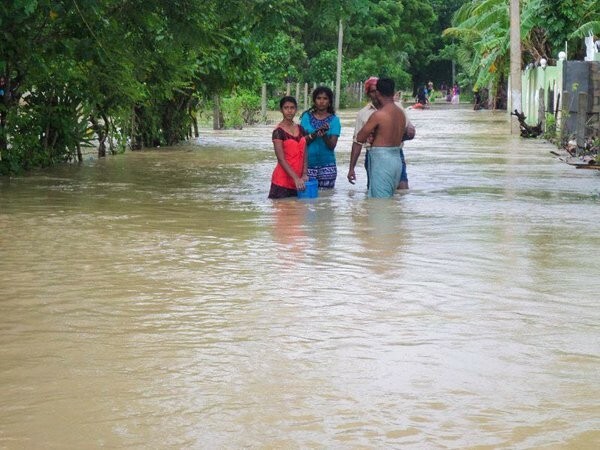 ChildFund operates on the ground in Sri Lanka and its project office in the Mullaithivu district has identified 9280 people who have been affected by the flooding with some 2320 families in the area of Puthukkudiyiruppu and Maritimepattu DS divisions. It is estimated that 3248 children have been affected and ChildFund has identified 106 children with disabilities have within that grouping. Many people have been displaced and are currently staying at schools and community centers which are being used as temporary shelters. Some people are stuck in their homes as their surroundings have been inundated by water, and are looking to evacuate to temporary shelters. Since the area has been inundated by water, people are not in a position to cook meals, and food has become a major issue. Drinking water and sanitation have also become a large issue in the area. It is reported that children have got fever due to the cold. Due to the heavy rain, the area has become cold and those affected are suffering due to the low temperatures and exposure to the elements without shelter, clothes, warm clothes and other sleeping material. Due to the sudden displacement, most of the people have been evacuated without few if any possessions, leaving them in need of temporary shelter, food, water, sanitation and health facilities. Right now ChildFund is planning for the following interventions in the affected areas of Mullaithivu it operates in, to bring relief to displaced families. Provision of cooked meals for project families focusing on families having children with disabilities. Provision of dry rations and nutrition packs for families having children with disabilities. Tarpaulins for families with damages to shelter. Mosquito nets for families in need. ChildFund will continue to monitor the flooding in Sri Lanka and will post updates as we receive them from ChildFund staff and parters on the ground, in the areas worst affected.